With the onset of Automatic Enrolment of Workplace Pensions, it now feels as if the panic and worry of Real Time Information (RTI) of PAYE changes are a distant memory and for the vast majority, it’s just business as usual now. But don’t become complacent! From 6th March 2015 you could face a fine of £100 or more if you’re not submitting your payroll information to HMRC in ‘real time’, every time you do your payroll. When does RTI have to be submitted in 2015? Employers need to start submitting tax and National Insurance information at the end of each payroll run. In October 2014, fines and penalties were introduced for businesses employing more than 50 employees who were filing their RTI returns late and from 6th March 2015 the same will be true for small and micro businesses employing up to 50 employees. What should you do if you get a penalty? HMRC will issue penalty notices quarterly, with what you owe, how to pay and what to do if you don’t agree with their decision. You must pay the penalty within 30 days or you may incur interest charges. What if you’re submitting late using Sage One Payroll? Our Sage One Payroll software makes it easy for you to send information to HMRC at the end of each payroll run. This is known as a Full Payment Submission (FPS) and HMRC expect you to do this ‘on or before the payment was made’. If you do happen to submit after the payment was made to an employee, HMRC are now expecting you to submit a ‘Late Full Payment Submission Reason’. 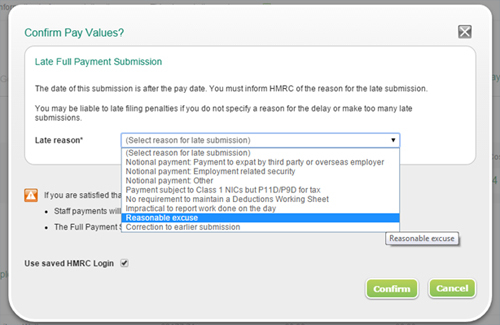 In Sage One Payroll, if you are submitting a late FPS, you will now be prompted to select a reason and this will be submitted to HMRC (see screenshot below).